Stunning multi coloured floral a line dress uk 10. Perfect for any special occasion. Definitions Embellished Orange Mix Occasion Dress, Size 16 - Gorgeous! 🌹 Bohemian style dress in gold, grey and pale blue silk 🌹. A perfect, bohemian style dress for more formal occasions. Covered in gold sequins and pewter beads. Gorgeous style for spring weddings. Great looking Dress with concealed zip fastening to back nice thickish material cotton and elastane sleeves just abit longer than short but shorter than 3/4 length. This is such a beautiful Damsel in a dress silk dress in a size 10. Gorgeous lightweight silk outer fabric and the dress is lined with 96% viscose and 4% elastane ivory/white stretch fabric. The dress is sleeveless and closes with an invisible zip down the back. Sleeves Kimono. Shoulder to hemline 36.5". Nataya dress 18/xl Brought for a wedding and was never worn. It's the most beautiful dress for a special occasion. Wedding, summer party or races. The dress has a cotton slip with delicate stitching on like the lace panels over the outside of dress. It's a beautiful blue green colour, so soft. The photos do not do this dress justice.The style is the great Gatsby/ 1920-30 dress. It is styled up the front a little and drapes softly at the back . I'm 5'6 and It never touched the floor on me.. Any questions Please ask. One very beautiful dress if your a lady. these dress are very expensive to buy. .Dispatched with Royal Mail 1st Class. Style: gorgeous layered midi dress; 3 layers different lengths. plain lining, floral dress with gorgeous pink/blush sheeer chequered top layer. ideal for parties or formal occasion. New & Unused. Gorgeous green pure silk with feature small black beading design. Next Signature ladies dress. MONSOON . 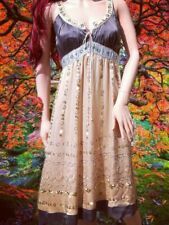 Stunning Khaki Green Embroidered Boho Style 3/4 Sleeve Soft Viscose Tunic Dress. Length 36". UK Size 10. Excellent Condition. Pull on loose fitting tunic style. Gorgeous dress in delicate spring floral fabric. Lovely dress. UK size L approx uk 14. Semi sheer long sleeves that have ties to make them shorter. Fully lined body. Waist 30" (but will stretch to 32". Chest underarms 33" (but will stretch to 35"). The vanilla-cream coloured top half, combines simple lines, with flattering 3/4 length sleeves, and is lined in white stretchy nylon. ). MINK, CHOCOLATE AND PINK (TANGIER). LOVELY QUALITY SILK WITH BEADING AND SEQUINS. FULLY LINED. The All Saints Solstice Dress is a long sleeved above the knee dress which is made from specially constructed Japanese material which has been designed to be soft, but with an exaggerated drape. Hence the fabric is very densely woven which is nevertheless fluid and soft to the touch. The dress is very stretchy and fully lined. Length-40’’. Waist-28’’. LACE NAVY DRESS SIZE 12 NEW LOOK APRICOT NEVER WORN. Condition is Used. Dispatched with Royal Mail 2nd Class. M&S Per Una Light Blue Floral Shift Dress. Belted with bell sleeves. UK Size 16. Delightful Angel Circle long shift dress with contrasting design panels. very boho chic. features tie dye, embossed silky finish roses and beautifully finished edges. beige, cream, light brown and green. BEAUTIFUL SOFT STRETCH FABRIC WITH VIBRANT WATERCOLOUR STYLE STRIPES. STRIPES ARRANGED DIAGONALLY IN THE SKIRT TO CREATE A STRIKING LOOK. FLATTERING SHAPE WITH SCOOP NECK AND SIDE SPLIT TO THE KNEE ON ONE SIDE. This is such a lovely and unusual occasion dress from Hobbs in size 12. The dress is a mid blue and white/pale blue/silver jacquard style floral pattern. There is an invisible zip up the back with a hook and eye closure, the dress is textured structured look dress and is really beautiful. Fabulous quality cotton jersey dress in a semi rigid woven cotton jersey in black with all over white Henna hands print. The dress is a short length with long fringing at the hem, making it a maxi dress but if you are tall, it may be more of a long vest/tunic length. Vila Vidaloa Dress. Sleeves: Long, Ruffle. Colour: Grey, Pink. Design: Floral. Materials: 100% Polyester. Underarm to underarm (laying flat): 19". Lace: 68% Polyamide, 32% cotton. Lining: 100% polyester. FREE GIFT WRAPPING & GREETING CARD WITH THIS PRODUCT. Back zipper. UK size 12. Brown colour with gold and red floral pattern. Really lovely and in excellent condition. With Hi Lo Hem & Strappy open back. In Excellent Condition. The dress is very stretchy. Waist-28’’.